Li Ka-shing’s latest restructuring effort may be a tidy-up too far. Fresh from separating out his property empire and bulking up in European telecoms, the Hong Kong tycoon wants his Cheung Kong Infrastructure unit to buy the rest of $18 billion affiliate Power Assets that it doesn’t already own. That would create a simpler, cash-rich company with lots of room to make acquisitions. But the all-share, no-premium bid doesn’t look great for Power investors. In many ways the deal is a victory for common sense: CKI already owns 39 percent of Power and shared projects make up more than 60 percent of net assets at both. Power has nearly $9 billion of cash, more than eight times as much as CKI, which has more scope to do deals. The latter does all kinds of infrastructure investing while Power focuses, unsurprisingly, on power networks. A new enlarged company would probably be more highly prized by the market too. It would become a bigger, more liquid stock, and be easier to understand, since more projects would come on to the balance sheet. CKI’s free float would also greatly improve, as the stake held by Li’s CK Hutchison fell to 49.2 percent from 75.7 percent. The catch is that Power shareholders are being asked to cede majority ownership without a premium. And the exchange ratio – of 1.04 new CKI shares for every share in Power – is based on their ratio from the five days up until Sept. 4. That follows a nasty bout of underperformance at the target. Over the last three months, a Power share was on average worth 1.11 CKI ones, Datastream shows. CKI promises a big special dividend post-deal, and the prospect of everyone sharing in the brighter future of the merged group. But neither need preclude better terms for Power investors. Under Hong Kong rules, if 10 percent of Power’s independent shareholders say no – a $1.1 billion bloc at current prices – then the deal fails. This may mean nothing: the bigger reorganisation of Hutchison Whampoa and Cheung Kong passed without comment. Still, institutional investors or vexatious hedge funds might try wielding some power of their own. 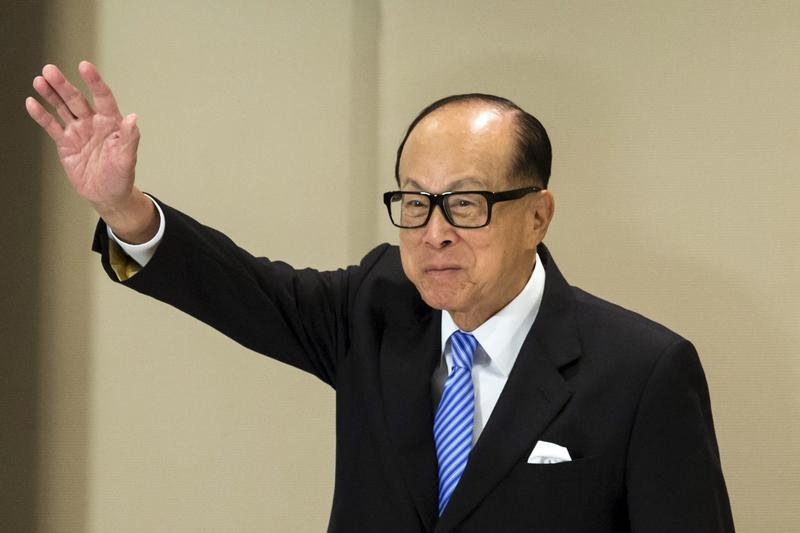 Hong Kong tycoon Li Ka-shing waves after a news conference in Hong Kong January 9, 2015. Hong Kong-listed Cheung Kong Infrastructure (CKI) on Sept. 8 agreed to buy the shares it doesn’t already own in affiliate Power Assets Holdings for nearly HK$90 billion ($11.6 billion) in stock. CKI already owns 38.9 percent of Power. Shareholders in the company would receive 1.04 new shares in CKI for every Power share they own, giving them 35 percent of the combined group. Shares in CKI closed at HK$66.15 on Sept. 8, before the deal was announced. CK Hutchison Holdings, which owns 75.7 percent of CKI, would see its stake in the combined group fall to 49.2 percent. CK Hutchison is 30.2 percent owned by the family of Hong Kong tycoon Li Ka-shing and was created by the reorganisation of Cheung Kong Holdings and Hutchison Whampoa, which completed in June. The deal requires the approval of independent shareholders in Power with votes cast against the scheme not exceeding 10 percent of total independent shares. Li’s net worth, according to Forbes estimates, is about $25 billion.